We are pressing in for the presence of God in our meetings and in our relationships. With all the meetings I find myself being drawn into more soaking prayer in the few hours I have alone each day. One of my life’s messages is that all fruitfulness flows from intimacy. My hearts desire is for an even closer and deeper friendship with God. At times, I am so hungry for more of Him that I find myself unable to concentrate on any other thought than wanting even more of the glorious life giving presence of Jesus. The longing is increasing. I feel like I am stepping into a season of greater grace and joy in extended times alone in His presence. I want to see Him. He longs for us to know Him and see the love and power of Holy Spirit living within us. I love Jesus more then life, more then breath, and more then any other person on earth. As I meet with people individually and corporately, I find Him there in them too. If I spend enough time in His presence, everything I do in ministry seems easy. If on the other hand, I feel pulled to do more then the Father wants of me, I find myself tired and frustrated. I pray we will all learn to live out of a place of fullness and rest. This is our loving Father’s desire for each one of His beloved children. Sunday, I had the tremendous joy of ministering at the weddings of two first generation Makua couples. The young women getting married both spent years growing up with us at the Village of Joy in Pemba. They are the first in their families to ever be married, and they both married pastors. I am reminded of the powerful vision I had in Canada before I really even knew who the Makua were. God took me up into His glory presence. I saw the colors of heaven flash before my eyes and was overcome with a desire to yield every thought, every action, and every moment of my life to Him. I felt as if I were right inside the Lord’s heart. God could have asked anything of me and I would have done it. My passion is for a life of love and obedience. It was during this transforming experience that I heard the voice of God. Jesus said, very clearly, “go and bring home my Makua Bride!” Now, with hundreds of others, we are bringing this tribe home to Jesus. What a joy it is for each one of us to hear, to love and to obey. I pray God takes us all into such a deep place of yielded love that we realize our destinies. We just graduated another group of incredibly joyful pastors. Today, they each return to their villages and families. They are now commissioned as harvesters called to minister the Kingdom of God on earth as it is in heaven. 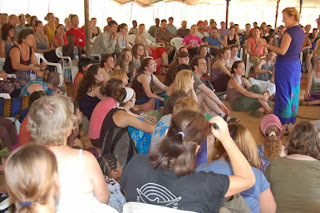 Directly after graduation, many of us took off to another village to share the very good news of the Kingdom. Makua youth ministered with drama and testimonies. Netto, one of our worship leaders, shared how he was one of the most feared and dangerous thieves in Pemba. He fearlessly told the crowd that he never had to purchase clothing before he gave his life to Jesus. He explained that he only needed to threaten people at knifepoint and that he either killed them or they turned over their clothing! Everything changed for him when he met Jesus. He thought he would never be married or have a job. Now the formerly notorious bandit holds the keys to the church and sound system and ministers with his beautiful bride. Last night, small children were the first to respond to the love of Jesus. Then alcoholics pushed through the crowds to receive prayer to be set free from their pain and addictions. I kept calling for anyone deaf to come forward for healing but no one came. As we were about to leave, I was trying to speak to one of our local leaders in the village about service times and he motioned to me that he could not hear me. He said his ears were greatly damaged during the war. After we prayed for him, his hearing was perfectly restored. God’s glorious Kingdom is expanding. Each one of us is called to carry His glory into a dark world. Thank you for your continued prayer and support. Please don’t stop. We love you and appreciate you. I had a dream the other night that I believe needs to be written down somewhere, so here it goes. I was traveling in a jungle type place, just lush gardens, green green grass and tropical. This couple from my church, Norma and her husband, were asking me to follow them because they were taking me to their home. I think there were bridges, the suspension kind that I am terribly afraid of, but I followed them, no problem. (It seemed like we were in Brazil?) I was busy checking out the scenery. There was a wall to my right, a vague one but it sort of resembled a climbing wall. I reached out to touch it to support myself along the hike and a nail punctured my hand, right in the center, in the palm of my right hand. When I pulled it away from the wall, it hurt. When I looked at my hand, I could see right through it! The nail pierced my hand all the way through and I was freaking out. I kept trying to yell for Norma to stop because I had been injured, but no one stopped or really noticed. I kept looking at this dime sized hole in my hand and it HURT. But there was no blood. So I asked God in my half-asleep/half-awake stupor what this was all about. He told me that it had to do with my sharing in His crucifixion. He said I was finally beginning to live in a place where I understood what all He died for and precisely what He did for me personally. He said when I become aware of my life and how it is so awesome because of Him being crucified, then I get to live in the way cool life that He set out for me as I live in the joy and reality and revelation of His resurrection. But that was just a side note. It was not an exciting dream and that part was not the part that was stressed. It was that my wound in my hand didn't bleed at all, because the blood had already been shed. But the wound hurt and there was pain that I had to endure. But the revelation of what He did for me was going to take US places we had never been before, as I begin this journey of understanding what He did for me, just me and where we can now GO together, as I live a life that is totally FREE because He died for my freedom and for me to have LIFE in Him. And this is a subject for another blog entirely...what my freedom looks like to me? What joy looks like? What my personal revelation can be described as... It is just me realizing that He died for every single solitary sin, addiction, vice, quirk, disease, illness, infirmity, EVERYTHING! He died so that I can now, not only have a relationship with God, but that I reach my hand into HEAVEN and get down what I need and I no longer live beat up, worn down, depressed about my past, my mistakes, or my uncertain future, because Jesus died for me. And He shows up! And He changes personalities, and opens doors, and makes a way, and supernaturally provides and much, much more. And that is wonderful. For we died and were buried with Christ by baptism. And just as Christ was raised from the dead by the glorious power of the Father, now we also may live new lives. A nossa natureza pecadora foi enterrada com Cristo, pelo baptismo, e quando Deus o Pai, com o seu divino poder, o trouxe de novo à vida, também nos foi concedida uma vida nova para desfrutar.